TAIPEI--(BUSINESS WIRE)--The first Antarctica Expedition team with the goal of reaching the South Pole via cross-country skiing in the history of Taiwan finally completed the great march at around 6 p.m. Chilean time on December 22, 2018 (5 a.m. on December 23, 2018 in Taiwan), after overcoming a serious of grave challenges. The team has safely arrived back in Taiwan on the morning of January 8, 2019. Gamania Cheer Up Foundation launched the “Antarctica Expedition” to commemorate its 10th anniversary, and soon after the march started on November 13, 2018, the team was faced with blizzards, which caused a delay in schedule. 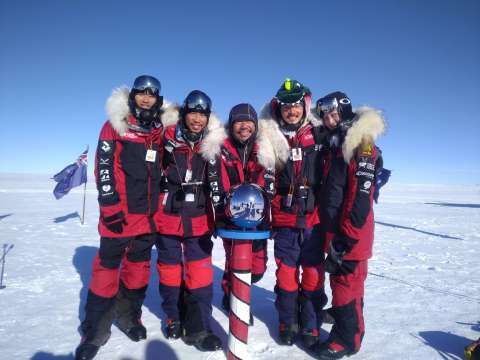 In view of various factors such as food supply and weather, they decided to adjust the plan, and abandoned the original 660-kilometer “Coast to Pole Route.” Instead, they switched to the more challenging “Antarctic Plateau Route.” Under the leadership of Captain Albert Liu, the team finally successfully reached the South Pole. As the first chairman of a listed company on the Taipei Exchange to have completed the feat of conquering both the Arctic and Antarctica, Gamania Group founder Albert’s adventurous spirit has always been his entrepreneurial belief; it is also key to his leadership of the group in its ambitious march forward. The Gamania Group has established itself in the game industry for over 20 years. Along the way, Gamania Group has encountered many setbacks, but has time after time overcome adversities, morphing into the eco-internet enterprise it is today. The very resilience that has driven the company forward to reach new milestones originated from Albert’s brave, adventurous spirit. Looking forward to 2019, Albert expressed that, “Gamania and I will not stop pursuing our dreams. I will continue to lead the group forward, to face and overcome challenges, and accomplish greater achievements.” The documentary of the Antarctica Expedition Team is going to be broadcast in Q3 this year. To enable the public to feel and understand the adventurous progress of the Antarctica Expedition Team, whether the glory of successful arrival or the escape while facing the obstacles, it will deliver the adventurous spirit of Great Dreams via video scene.